Now I'd just like to say that I'm not a person who cries at movies. And it was this that told me how good this movie is. Because I cried twice. The story of this is brilliant. 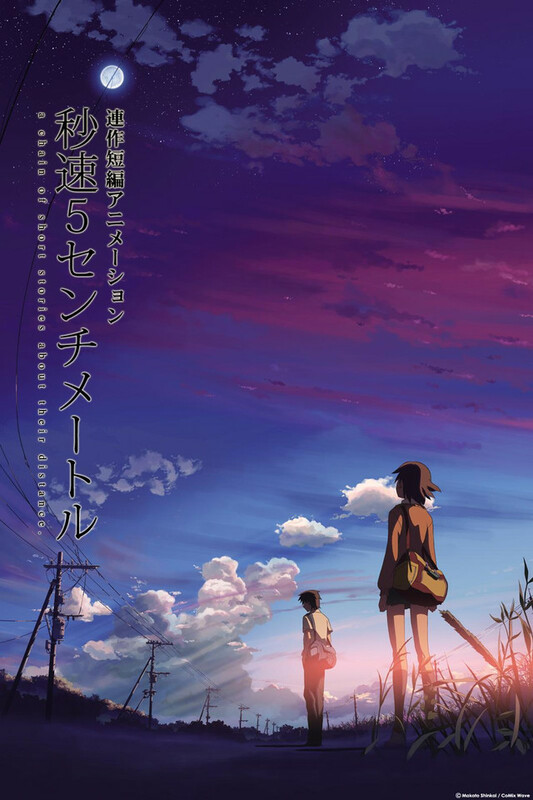 Told in three parts, it talks about two childhood friends, Takaki and Akari, as they get seperated and begin to grow apart as the distance grows between them (which makes the title of the movie extremely clever when I worked it out). This way of storytelling by making it into three parts was something that helped the story of the movie a lot and would be something I'd like to see tried in a big Hollywood movie because of how clever it is. The first part tells you about how the two became friends before being seperated and then Takaki's journey to see her. This one is possibly the best of the three and is superbly done. It shows how young love can blossom and has some really touching moments, especially when he gets to the train station (avoiding trying to spoil the story here). The second part of the three shows what happens when he moved from Tokyo and is about to decide which college he wants to study in next. Kanae Sumida fell in love with him as soon as he arrived, finding him different from others. They meet in the car park to ride their mopeds, and I won't say anymore to again avoid spoiling it for people who haven't seen it yet. While you feel it more in the final part, you begin to feel sorry for Takaki as he begins to forget Akari. The final part is the shortest and shows what happens when they are both adults. While Akari has moved on and is now engaged, Takaki has been unable to, and when you see him wallowing in borderline-depression over a can of beer you will feel bad for him. The music video afterwards which finishes the movie aswell as sum up the rest of the movie. There is no way that you could not feel emotion at this. But the movie works because of the characters in it. Everything that happens in this is something that people can relate to. You can feel the characters grow up, and this is something I don't seem to feel in a lot of movies. They all feel like people that I could walk down the street and find because they feel believable. As you can probably tell by looking st images, the animation is absolutely jaw-dropping, and an absolute work of art. I can't say anything about it that could do it justice. This is a movie that you absolutely have to watch at least once in your life, and once you've seen it, I don't think it's possible to forget. Brilliant. I really loved it,the animation is great and and it's definitely one of my favourite animes. It's based around a girl and guy who went to school together and get separated. It is one of the saddest things I have ever watched and I was crying for a while afterwards.It really is great and it's only about 1 hour long,so if you ever have spare time I would recommend watching it,although your heart will definitely hurt for a while. I guess, I could consider this my situation as well. It's been a while since I watched this movie, but it forever remains in my heart. About a boy and a girl who became so close, yet lived so far away from each other. Found ways to meet each other. We follow the boys story for most of the movie. It was incredible! VERY fitting for this movie, trust me, you'll love it. Especially when the girl is surfing, that OST was beautiful. The boy is very lovable. He tries hard for the girl. But as the story progresses, he starts to act more like a stranger. The girl as well, but then at one point there is another girl who is equally lovable, in a sense. Nothing to say here, BEAUTIFUL ANIMATION. *I wish I could say more in this review.. but it's been so long since I reflected on this movie... I hope long distance relationships, for most of us, work out! Really, they are beautiful.